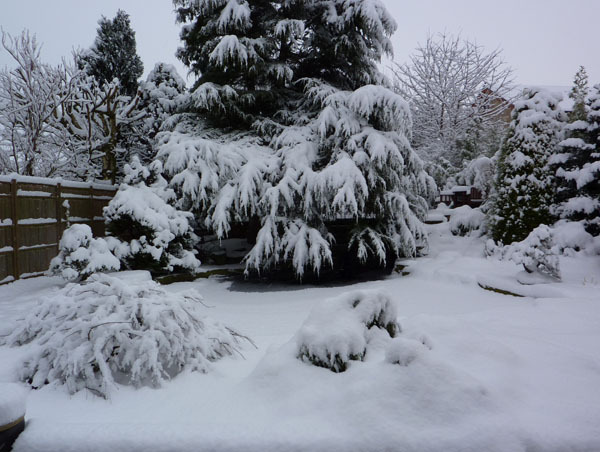 JANUARY 2010 – A WINTER WARNING! Many readers around other parts of the world may not be aware of this but most parts of Europe are now having their worst winter since 1981-2. I remember that winter very clearly as I was working all of Christmas day and finally found a perfect way to seal butyl rubber sheet to a bottom drain for the first time without any trace of leaks. It was bitterly cold and sheet ice was everywhere – even inside the unit I was working in. Weather forecasts today (9th. January 2010) predict that the worst is yet to come and, in the UK, February is always the worst month of the year. Before I begin to cover the meat of this page I will first point out for the thousandth time that Nishikigoi and true Carp in general are NOT a coldwater species of fish. They are, in fact, a temperate water species of fish and should not be confused with the genuine European coldwater species that are found in our eco-systems of rivers and lakes. Carp have been introduced to these eco-systems many years ago but they are most certainly not indigenous to them. It is Nishikigoi I am writing about here and more specifically Nishikigoi that have been produced in Japan. I would hazard a guess that these fish, especially the higher quality ones produced, may possibly be ten times weaker with regard to handling cold water temperatures than the black carp known in Japan as Magoi. Furthermore I know of no Nishikigoi bred in Japan that have ever experienced water temperatures less than 10C before shipping for export. Right now in Japan the Koi are all housed in indoor systems and the water is given added heat by way of oil-fired heater units. 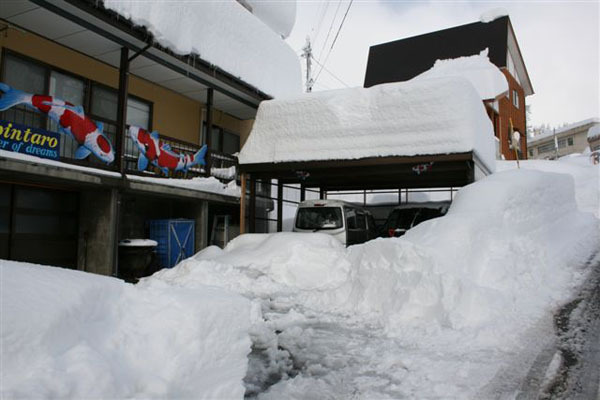 This is a recent picture of the state of the weather in Mushigame village on New Year’s Eve 2009 some 10 days ago. I assure you the weather is bitterly cold outside but the Koi are not. Over in the UK, this unusually cold weather has highlighted an age-old problem that has always been here and that is Koi losses due to the cold water. They are with us earlier than usual and, if the truth is known, there are tens of thousands of Koi dead or dying throughout Europe as I write this. The ones that die quickly are blessed but the majority take from weeks to months of daily agony and torture to eventually croak. Some may just hang on until May before they eventually give up and cannot adjust to the rise in water temperature. It is then when the ‘instant experts’ jump in with the old chestnut of ‘Spring Sickness’ when there is no such thing at all and never has been. It goes on and on, almost as an attempt of self-justification. None of this absolute claptrap has ever washed with me and I have known the effects that long periods of cold water have had on Nishikigoi for many years. This year highlights things more clearly than in previous years but winter losses are always here. In 1985 some visionary UK Koi enthusiasts started to heat their ponds in winter and many followed. I assure you this has saved thousands of unnecessary Koi losses and we still seem to be arguing pros and cons some 25 years later? I have tried to be ‘nice’ about this matter for years and there is a page on this website in the ‘Keeping’ section that states Nishikigoi are a true four season fish, it also gives suggested running temperatures for optimum health. I have also included this information in all my books on Koi. There are other species of ornamental pond fish on sale and these can all handle cold-water temperatures with no discomfort at all. I have often wondered where all the Koi Societies around the UK are when their members need them. These are bodies that profess to promote good Koi keeping methods to their members. WHERE ARE THEY NOW? WHY ARE THEIR WEBSITES NOT ALIVE WITH GREAT BIG WARNINGS OF THE DANGERS OF WINTER TEMPERATURES TO THE KOI? Forget the so-called ‘specialist Koi magazines’ they cannot help even if they were aware of the dangers their ‘valued readership’ is facing. Yes, they will handle paid advertisements from heater manufacturers right now but they don’t want to rock any boats. By midsummer 2010 they will need to cater for those other advertisers who have large stocks of replacement Koi at the ready as well as piles of useless medications to cure ‘spring sickness’. Whilst all of this is going on, the breeders from other parts of the world who supply cheap Koi will be rubbing their hands together in expectation of a bumper spring and summer ahead of them, they will be praying for these sub-zero water temperatures to continue. Your mains tap water is probably warmer than your pond water right now. If this is the case get this into your pond constantly and overflow to waste. Yes, there may be chlorine content but it’s the lesser of the two evils. Keep your filters and aeration running at all times. Do as per the above but incorporate a dechlorinator unit to your mains water as well. Small systems can benefit with a number of 300-watt aquarium heaters placed into the filter system. Wind chill is the biggest culprit of heat loss to a pond and a filter unit. Polycarbonate sheets or any other clear membrane fixed to simple timber frames can help here. Do make sure there is a gap above water level where the water is allowed to vent off. Larger systems require in-line electric fish-safe heaters for emergency periods. Do try to increase temperatures no more than 1.5C per day until the desired running temperature is achieved, after that the thermostat should take care of the daily running. The real dangers are not only the cold water periods for long times, even more dangerous is when a very sunny winter day is followed by a freezing cold winter night and this produces significant temperature swings that the Koi find it very difficult to adjust to. Hence the need for some thermostatically controlled heating which removes these acute temperature swings. It should be pointed out here that a one-degree up or down change to a human being is four times greater to a Koi. This is my pond taken 05/01/10 – believe it or not there is a large Koi pond there. All the Koi were removed on 23/12/09 to another pond and my old filter system was shut down with the exception of the waterfall only. The saddest part of all this is that the Koi enthusiasts who read Koi websites and forums and those who are members to Koi clubs only make up around 5% to 10% of the ‘Koi keepers’ in the UK. The other 90% to 95% will continue to buy Koi in spring, feed them through to winter and then watch them die in winter. These people will wait until spring and then purchase new stocks as usual after cleaning out their ponds for the annual event. Also as usual 95% of the Koi will be lost after less than one year of purchase! NISHIKIGOI ARE NOT TRUE COLD WATER SPECIES – HOW MANY TIMES DO I HAVE TO SAY THIS AND ALSO GIVE ABSOLUTE PROOF AS TO WHY I SAY THIS? KOI ARE BEAUTIFUL CREATURES TO LOOK AT AND TO ENJOY. KEEPING KOI PROPERLY IS NOT A CHEAP HOBBY, IT NEVER HAS BEEN AND IT NEVER WILL BE. IF RUNNING COSTS, WATER COSTS AND HEATING COSTS PRESENT A FINANCIAL PROBLEM PLEASE DO NOT BUILD A KOI POND!